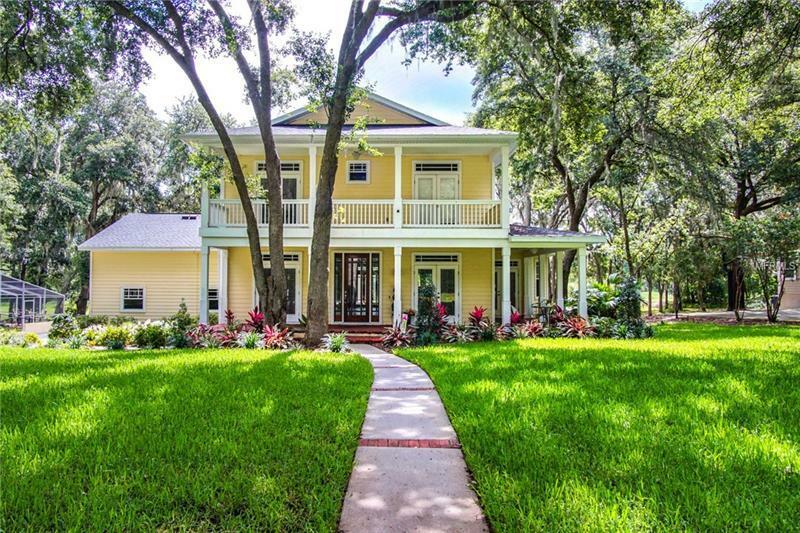 New Price on this Hyde Park Southern Charmer in exclusive gated community of Fish Hawk Trails. Lush landscaping, brick pavered sidewalks & wrap around brick front porch welcome you as you approach the home. Step inside & you immediately notice all of the wood trim detail, crown molding and columns. This home has a NEW ROOF 2015, wood flooring throughout the main living areas, master bedroom & stairs. The kitchen will please the chef in the family with it's recent updating including new quality wood cabinetry & self close drawers, granite tops & tile backsplash, pendant lighting, new fridge, new dishwasher, gas center island cooktop & wall oven. The L shaped bar area has ample seating for a crowd and there is a cozy window seat in nook area. The family room w/ fireplace is adjacent to the kitchen and overlooks the private backyard and community trail system. Off the family room is a back porch balcony that steps down to the pool area. The master suite is located downstairs and has a sitting area, two large walk in closets and master bath with garden tub, tall cabinet vanity, dual sinks and separate shower. All of the secondary bedrooms and bonus room are located upstairs and are quite spacious with walk in closets. Two of the bedrooms share a Jack n Jill bath and both rooms have French door access to upstairs front balcony. Fish Hawk Trails is a gated, guarded 24/7 community with miles of trails, parks, tennis courts, basketball and clubhouse. Close to amenities & outstanding schools. Come see it today!